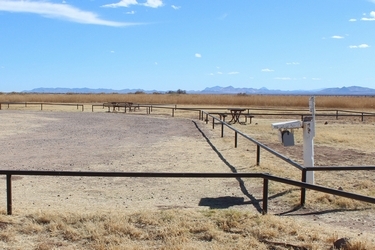 White Water Draw is a wildlife refuge north of Douglas Arizona near the small community of McNeal. 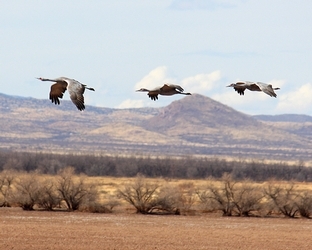 The 1500 acre refuge is administered by the Arizona Game and Fish Department and is primarily known as a winter refuge for thousands of migratory Sandhill Cranes. 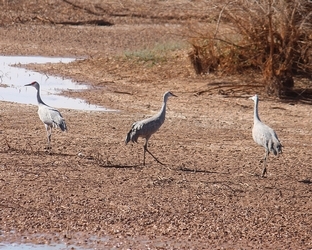 The cranes usually arrive in November and may stay until March. The birds may come from as far away as Canada. This was my first trip to the area and I did not know what to expect. 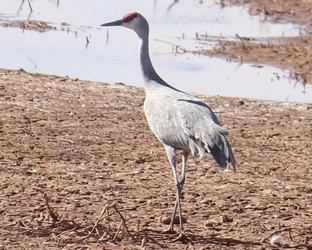 Since it was the very end of February, I didn't know if the cranes were still in Arizona. I had also read that sunrise was the best viewing time. 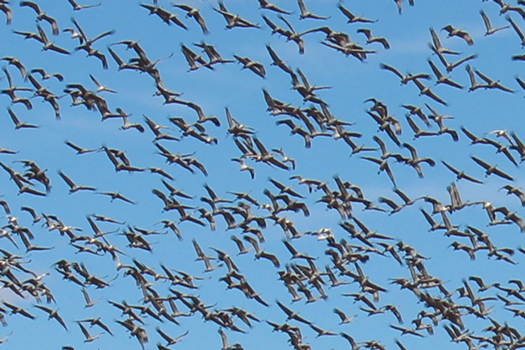 That is when the birds take flight and move to their feeding grounds in the grain fields of the Sulphur Springs Valley. I arrived after noon. Would they be back at the refuge at that time of day? There were only a few cars in the parking area and there were no directions on how to proceed, so I just got out of my truck and walked toward the ponds that could be seen to the west. There was not very much water in any of them. In the distance to the north, I could see many gray "bumps" covering the end of one of the ponds. The view through my camera lens revealed that the bumps were large gray birds. The Sandhill cranes were here! Before all of the birds settled back to the ground, three broke loose and flew toward me passing by just a few yards away. The three birds not only did a close flyby, but landed so that I could get a very good look! 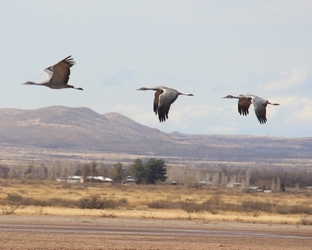 I knew before the trip that Sandhill Cranes were large gray birds with a red patch on their heads. I did not know that there are two subspecies. The two varieties can vary from 3' to 5' in height, have wingspans of 6' to 7' and weigh from 6 to 10 pounds. The water level in the ponds was quite low. There were a few other water birds, but not many. From the extent of the mud, it looks like the ponds at times could be quite large in area. 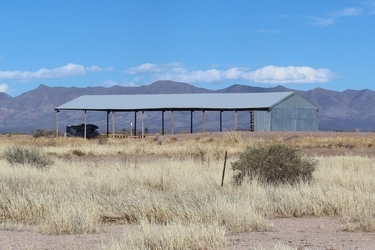 There is a large ramada( a former hay barn), restrooms and a small campground at the site. There is no visitor/administrative center. I am not a serious birder. 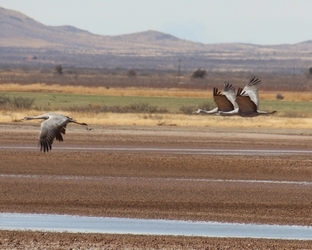 I had come to locate the refuge and perhaps see the Sandhill Cranes. I had not come prepared with a pair of binoculars or a bird book. Without those tools available, I was soon ready to move on. I will come back again and try to be here at sunrise to see the early morning liftoff. I will also be better prepared to understand what other creatures are using the area.